The first signal upgrade project on the Central Oregon and Pacific Railroad of 2001 is underway just south of Roseburg, Oregon with the installation of a new colorlight "Flowerpot" with Electrocode circuitry. Coming out are two sets of US&S Style B Semaphores at MP 568.0 (above) and 569.1 with the new signals going in at 568 . This work is required in order to remove the pole line under Interstate 5 so that reconstruction of the bridge (barely visible in the above picture) may proceed. Federal and State highway funds are paying for the signal work. The new signals will be cutover on April 19 or 20, 2001 and the Semaphores pictured on this page will be taken out very shortly thereafter. Single Signal 5680 and Double Signal 5681 are located next to the Happy Valley Road grade crossing south of Roseburg in the Green District. About a mile north and alongside Highway 99 are double Semaphore 5692 and single Semaphore 5691. These signals are easily visible looking north from Interstate 5 northbound just before crossing the South Umpqua River near MP 120. Both pairs of Semaphores will be replaced by a single "Flowerpot" installation with a pair colorlight signals. A few feet south of 5681/5682 the prefabricated steel foundation for the flowerpot has been dug in and track wires poke up through the rock and steel. 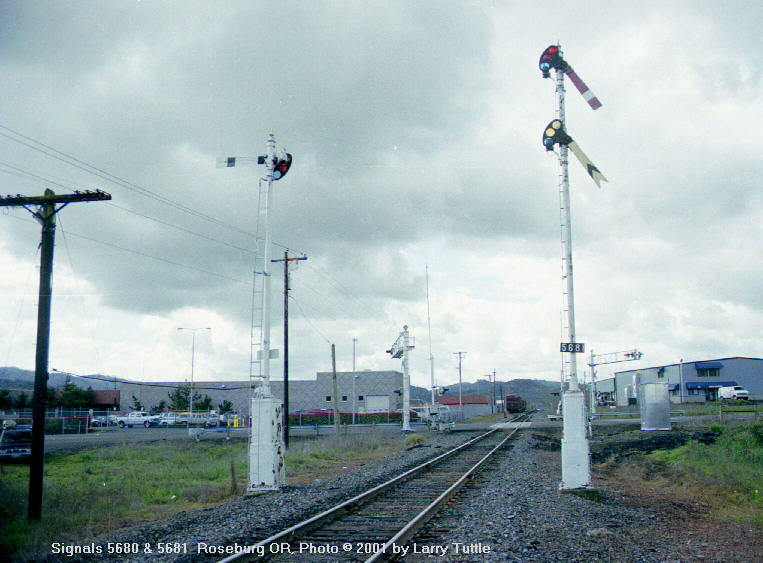 The restricting indication of the single semaphores in these pictures is the result of activity in the Roseburg yard three miles to the north. The major components of the new signals arrive on a flatbed trailer pulled by CORP's dump truck. Signal Maintainer Rick Perry loosens the straps to the case as the boom truck prepares to lift the case. The boom truck is set up as a high rail vehicle, has "put on" at Happy Valley Road and is shunting the signal circuit resulting in the double blades displaying a restricting aspect. Lifted off the trailer, the new case is framed by the signals it will replace as it's eased across the tracks. Rick guides the case onto the bolts sticking up from the foundation. Your Web Master was invited to put his camera aside and assist in lining up the bolts with the holes in the bottom of the case. After a bit of a struggle and some rocking and rolling, the case settled down, was leveled and tightened to the foundation. Next the mast assembly is lowered onto the case. Behind the case is a pallet containing the 90 degree elbows which attach to the masts and hold the heads, also in boxes on the pallet. The color light head for signal 5680 will be illuminated by LED's -- the first such signal on CORP.
Rick put your Web Master to work some more bolting the mast to the case. After the boom truck "puts off" the rails and Rick releases his Track Warrant, the AM Dillard job is cleared south out of Roseburg and through our location. The recently installed mast assembly makes an ideal platform to record one of the last passages of a train through these Semaphores. Ignoring the partially complete flowerpot assembly on the right, this string of log loads splitting the blades makes for a timeless scene.